You shouldn’t have to stand still to collaborate… Roam, a mobile whiteboard, allows for on-the-go collaboration. With a simple and clean design, Roam is a prime example of form meeting function. 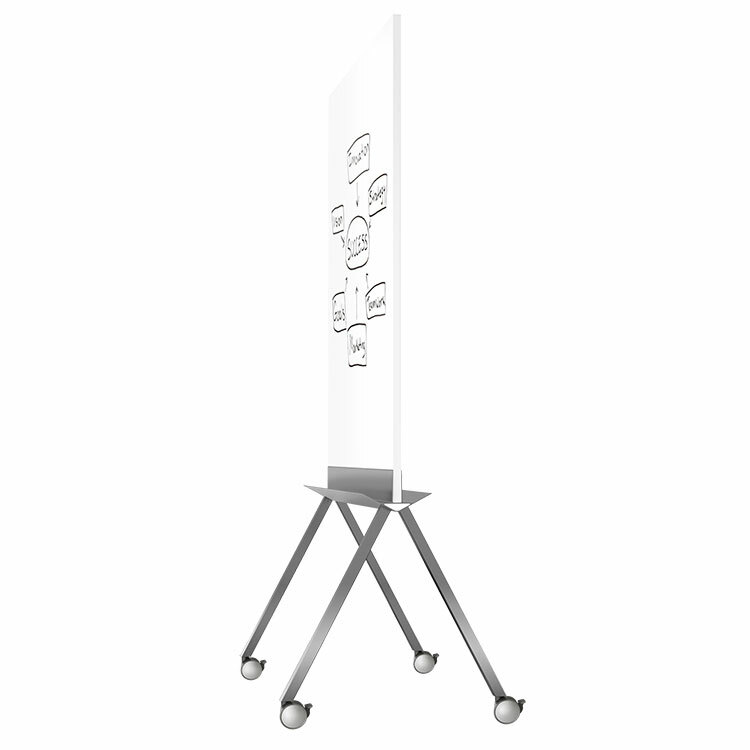 Line up multiple Roam whiteboards to create a larger dry erase surface for use during presentations or move them around the room for breakout sessions. When not in use, the unique nesting feature allows multiple units to fit within a single footprint, maximizing your valuable space. You shouldn't have to be stationary during collaboration and brainstorming. Go ahead… Roam. Roam's heavy-duty casters allow for ease of use across multiple flooring surfaces. Locking casters keep the board in place when in use. 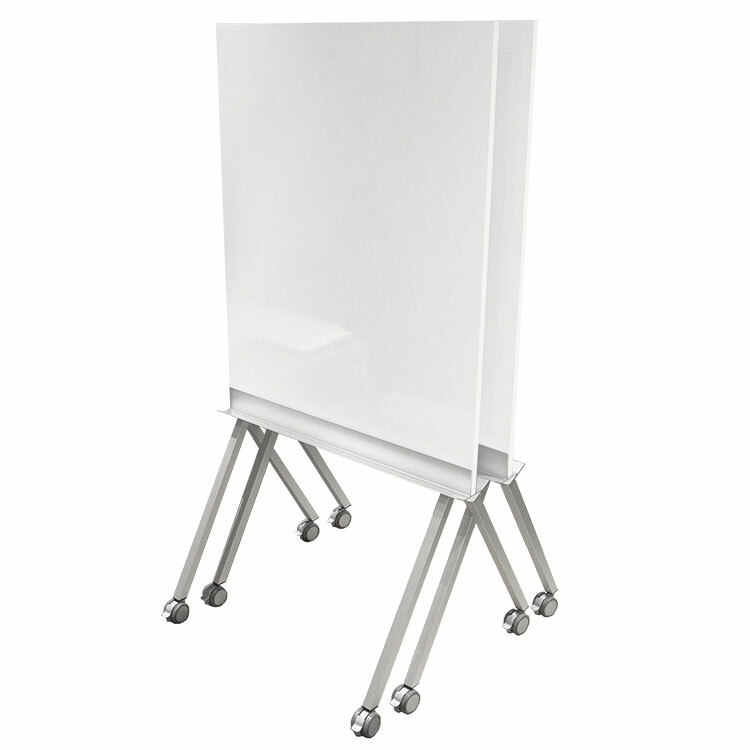 Designed with a simple form that maximizes the amount of writing space, offering a functional whiteboard that can work in any situation. 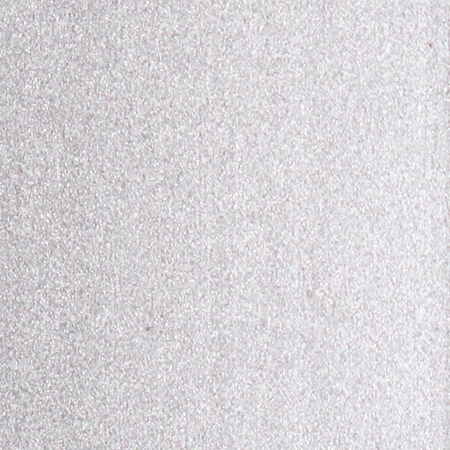 A full-length accessory tray sits at the bottom of the whiteboard panel, holding markers and erasers within arm's reach. Height of the writing surface is optimal for seated and standing positions. The low center of gravity creates stability when in use. The legs and tray were designed so multiple boards could nest in a line, reducing the footprint and saving valuable space when boards are not in use. Roam carries a 10-year warranty and is made in the USA. Ghent's Roam Rolling Whiteboard is the perfect solution for on-the-go collaboration and brainstorming when wall space isn't available. Designed to be simple and clean, Roam features a full-length, double-sided tray and a double-sided, edge-to-edge dry erase surface. Roam's premium laminate whiteboard surface (36" wide x 45" tall) allows you to write from a sitting or standing position, creating versatility and comfort. 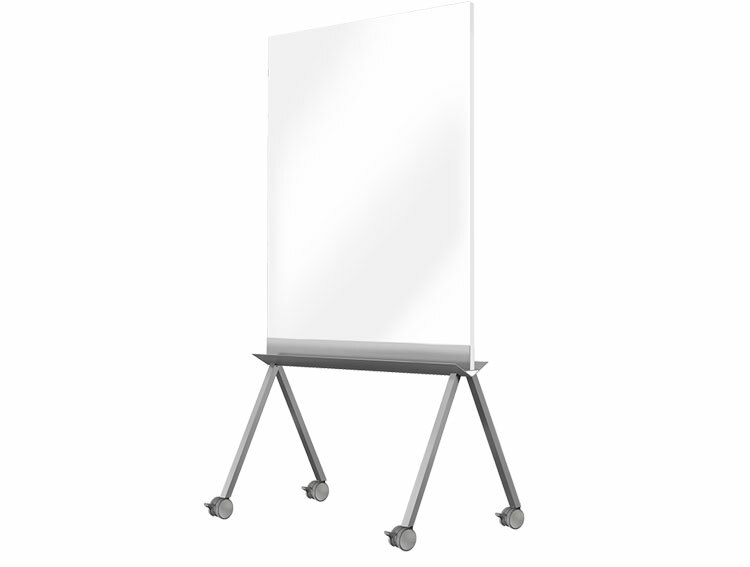 Line up multiple Roam whiteboards to create a large dry erase surface for use during presentations or move them around the room for breakout sessions. 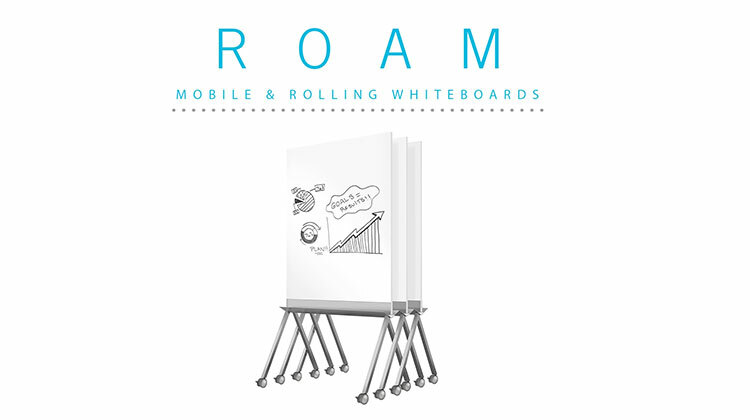 When not in use Roam Mobile Whiteboards nest together, so that multiple units can fit into a single footprint. This reduces the amount of wasted floor space, making sure your valuable space is being used properly. The board weighs is lightweight, weighing less than 50 pounds, and stands 68" tall when assembled. With aluminum legs and a low center of gravity, the board is easy to move around the room or into another office or open workstation. Each mobile board ships to you in Ghent's worry-free packaging, designed specifically for shipping whiteboards, and assembles in less than 10 minutes. Roam comes with 4 markers and an eraser. 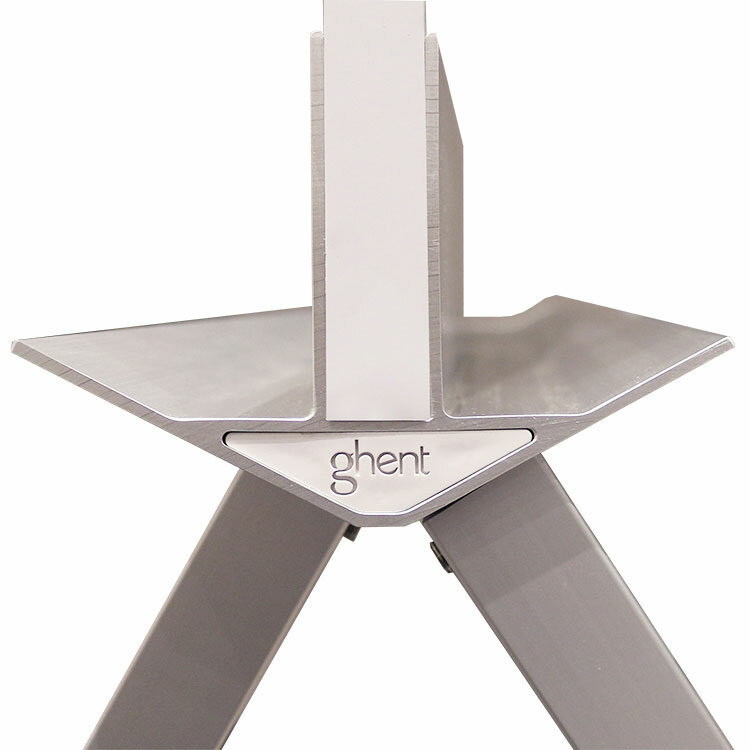 Ghent's full line of mobile whiteboards, including Roam, carries a 10-year warranty and is made in the USA.